Inquisitive, provocative and results oriented, David is willing to dig into problems until their true essence is understood and the solution is executed. We love that at Playbook! My last blog post was about an example of great packaging design from Girl Scout Cookies, and I pointed out that we can learn Lean and Agile lessons from anywhere. It turns out we can also apply Lean and Agile principles anywhere as well. So if you want some easy tricks to solve some common parenting problems, keep reading…! So, one day I decided to make a chore board and was shocked at how much of a difference it made. Since there weren’t any dependencies in the sequence of chores, and there was no need to track their progress through any phases, we were able to start with the most basic visual work management board. 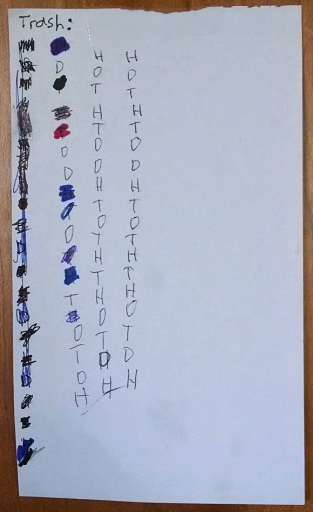 We just put each name on a row, a list of chores across the top, and a box they could draw the checkmark in when they were done with each chore. To say that this simple tool was effective would be an understatement. I used to think that kids just didn’t like doing chores. But now I’m convinced they really don’t mind as long as the expectations are clear! Even though this worked great and was a simple board, after a few weeks we realized it still required someone (Mom or Dad in this case) to update it regularly with the common repetitive chores like taking out the garbage or emptying the dishwasher. So we came up with an even easier way to make those happen. 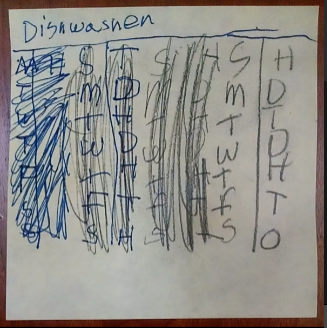 Even though garbage and dishwasher were both regular chores that we wanted them to take turns doing, there was a slight difference that required us to use two different visual work management systems. The dishwasher had to be emptied every morning. But the garbage gets taken out when it’s full, so the frequency is random. And since the dishwasher has to be emptied before school and it takes more than a few minutes, they liked to know in advance if it was going to be their turn. So they each chose two days of the week that it’s their job and they created a list that looks like this. Now there’s no question whose turn it is and the dishwasher magically gets emptied six days per week…! But taking out the garbage is a different story. It needs to happen randomly, so the days can’t be assigned. And it only takes a minute to do, so there’s no reason they would need to know in advance. These slight differences required a fairly different visual project board. So they made a long rotating list with the initial of their first names. Now when the garbage is full, Mom or Dad simply takes the can from under the cupboard and puts it on the floor in the kitchen. (To make it visible...!) Then, when one of the kids takes it out to the bins, they cross their next initial off the list. This way it’s very clear who has done it and how often. And it highlights who hasn’t done it in a while. You can see from the image above that Dylan is falling behind and if he doesn’t start catching up soon, it will be his job for the entire summer. Talk about motivation…! Just like the other two visual work management tools, this too had great results because the team members are empowered to make their own decisions and do the right things at the right time. So, if you have kids and are looking for ways to get them to contribute more, take a few lessons from Lean and Agile and make the work visible, and the ownership clear. Just be sure you use the right format for the visual work management tool. And if you have some other ideas that have worked, please share them with me! One of the takeaways here is that small changes in the type of work create different requirements for the best visual work management tool. We learned this lesson when we first created PLAYBOOK. When we first started teaching our customers how to set up and run manual visual work management systems, the design of the board was failry basic. And even though it provided a clear benefit, we immediately started improving it and went through six major revisions before we had refined it to get the best results. By that time we realized the next improvement would have to come from making it electonic. But because we had developed the process to solve the unique challenges of hardware product development, we were unable to find an existing software tool that would work. So we built PLAYBOOK from scratch, and designed it around seven key principles which you can read more about here. Or watch the demonstration video to learn more.